When the baby girl arrives or has her very first birthday, celebrate with these charming pink roses and white daisies in a white wicker basket. Great for nursery or kitchen. 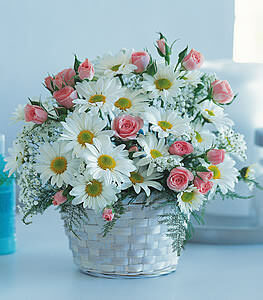 Daisies and roses arrive in a white wicker basket. Just wanted to say thanks. My girlfriend loved the flowers!